Wenona (population 1,065) is located in Marshall County, about 15 miles south of the Illinois River. Illinois Routes 17 and 251 meet at the north end of the business district (which is also the intersection where the school building pictured above is located). The town was plotted around the 1850's. A very nice history of the Wenona school system can be found at the web address of http://www.genealogytrails.com/ill/marshall/history/WenonaSchool.html#History . A high school was first started in Wenona in 1885 in a building which was built in 1865. From 1891-1918, the school was located where the bandshell of the City Park is now. A three-story structure, the high school was housed on the second floor and the top floor was used as a basketball gymnasium. In 1905, the enrollment was 51 students and four teachers. In 1927, the present structure was completed and served the community's high school youth until consolidation with Toluca and Minonk-Dana-Rutland in 1992. That building today is used as Fieldcrest East Junior High. High School students now attend Fielcdreat High School in Minonk. Good old Wenona, we'll all stand here! Join our chorus, shout our cry! Fling out the banners to the sky! Good old Wenona, Fight, Fight, Fight! The Wenona Baseball team won one Regional Championship, in the 1963-64 school year. Baseball then was offered as a summer sport and the summer of '64 was a time to remember for the young group. The boys baseball team also brought home Eight Tri-County Conference Championship trophies. 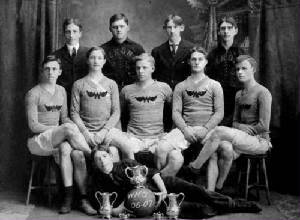 The Boys Basketball team won most of Wenona's trophy case space, starting in 1930-31 when they won the school's first District Championship. They completed a back-to-back District effort in 1931-32. They also won a District in 1938-39. Their first Regional championship came in 1949-50. Another Regional followed in 1953-54, and they won Regionals back-to-back in 1964-65 and 1965-66. Their final Regional came in 1972-73. Wenona was one of the smaller school forces in the Illinois Valley region for many years. As the photo to the right shows, the program likely started in the late 1800's. In a Dec. 8, 1989 Tri-County Conference game against Henry-Senachwine, Wenona prevailed in FIVE overtimes against the Mallards, 75-73. Wenona was the place where two great coaches got their start. Coach Bernie Brady started his coaching career at Wenona and went on to coach in the Maine Township School District in the Chicago suburbs. He finished with 300+ wins. Coach Eric Bryant, who would lead Spring Valley Hall to back-to-back second place finishes in 1997 and 1998, spent one season of his coaching career in Wenona in the late 1970's. The Wenona hardwood court program also had one individual named to the Class 'A' All-State First Team. Kurt Scheuer accomplished this feat in his senior season of 1975-76! Kurt averaged 22 points a game that year including a record that will stand forever. His 46 point effort as a Wenona Mustang against Minonk-Dana-Rutland will forever be the school record for most points in a single game. Kurt was selected to the first string all-conference team his Junior (1974-75) and Senior (1975-76) years as well. Wenona HS boys basketball also won a total of FIVE regular season Tri-County Conference titles and TWELVE Conference Tourney titles!! They were in 12 other conference tournament title games as well. Below are the IHSA seasons in which hardware was won by Wenona boys' basketball teams. Unfortunately, team records & coaches' names are not available at this time. The first school trophy in history was won in 1925 when the Wenona Boys Track team finished in third place in the "B" Division in the IHSAA. The boys also won four Tri-County Conference Champiionships. 1924-25 Track Team Finished THIRD in STATE 'B' MEET Competition!! W. Metzger Javelin Throw STATE CHAMPION!! The WHS Girls Basketball team won a District Championship in 1980. The girls also won four Tri-County Conference Championships. Unfortunately the team record and coaches names of these and other great WHS girls teams are not currently available. 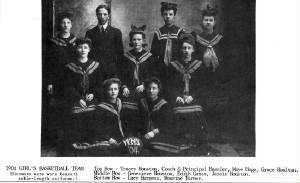 Girls basketball was a part of the athletic programs at many schools in the early 1900s. This is evidenced by the photo sent to us by Mark & Terri Taylor of TnT Images to your right. The IHSA decided that this was not acceptable for young ladies and banned this sport in 1908. Some of the better seasons in Wenona HS girls basketball are listed below. Back when Girls Softball was just one class, the WHS ballers won a Regional championship in 1977. Again, we are looking for the team records and coaches hames of the bettter teams in WHS history. Three Wenona HS girls softball teams won conference championships as well. Patty Goropesek, Sharon Canty, Kelly Christ, Gail Kurrle, Georgia Russell, Jane Lindgren, Jan Durham, Brenda Berg, Tricia Schmillen, Kris Hendrickson, Ann Senter, Susan Hackleman, Diane Zulz, Janet Flahaven, Annabelle Russell, and Marcia Burroughs. The WHS Volleyball team won a District Championship in 1981. 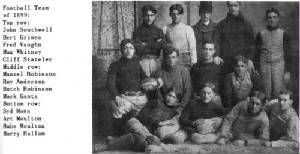 We do know that the Wenona High School boys competed in football for sometime. The program was started shortly after the school was started in 1895. The photo to your right depicts the grid iron warriors of 1899-1900. The photo was supplied by Mark & Terri Taylor of TnT Images (www.tntimages.com). We do not have any further information regarding the football program at WHS. If you do, please share it with us by sending us an e-mail at ihsgdwebsite@comcast.net. "One of the most vivid memories of Wenona High School was when President Kennedy was killed. I was in Ag Class and our teacher Mr. Wiley told his to stay in the room he would be back. We later found out the whole school shut down while the teachers, Principal and the Superintendent decided how to break the news to the students. I remember the tears that all of us shed that day, about the unknown. CNN wasn't even a dream at that time! There was a long standing tradition between Wenona and Minonk-Dana-Rutland High School about playing once a year for the "Little Brown Jug". If I remember right it had the years written on it which school won the "Jug". That high school that wond kept it for a year. When the schools consolidated I assume the "Little Brown Jug" ended up in Minonk. I think finding the Jug and the information about it would had to both schools history. It is a small tradition that may be lost from the days of rural America. I also remember the gym packed as it was as big a social event for Wenona as when we played our "Arch Rival" Toluca." "I was a junior in '72-73 and I was on the Wenona Mustangs basketball team, though quite a way down on the bench-it was an excellent team led by three seniors-Steve Flahaven, Randy Barke and Bob Peterson. Rounding out the starters were juniors John Hatton and Steve Scheuer. We had a solid regular season, including beating our rivals, the Toluca Wildcats twice. The Rinker family had moved to Toluca that year and has three brothers, two of whom were on the varsity basketball team, tall and talented. The rivalry between the towns had always made for great games, that year the top talent on both teams really stoked the fires. Toluca has a write up in the Peoria Journal Star about their team that got Wenona folks a bit riled as we had beaten them twice and here was Toluca getting the press! I believe it was right about the time both us and Toluca won our regionals that the Journal Star did a piece on us Mustangs to "even up the publicity." We subsequently lost to the Wildcats in the sectional (on our home court to boot if I remember right) for a bitter end to a glorious season-I remember going to the supersectional game with teammates to see the Wildcats lose to Jack Sikma and his St. Anne's team. According to the IHSA site the Mustangs were 23-2 that season and were ranked 11th in the final AP regular season poll. The number one team was Ottawa Marquette with a 23-1 record. I'm sure one of our losses was to Ottawa during the regular season. Toluca was ranked at number 15 with an 18-5 record. Ottawa Marquette bit the dust in the supersectionals to Maple Park (Kaneland) which made it to the finals and lost to Ridgeway with Maple Park having a regular season record of 20-12. I mentioned the starters on the team, along with myself other bench guys were Randy Lohr, Brian Reh, Bill Healy, Mark Stasell and Mike Smith-there are more guys but my memory ain't what it used to be. As for my basketball career, I scored one point my junior year (not averaged, scored) by banking in a free throw at a blowout in Brimfield. My senior year I scored a grand total of eight points, which was enough to be voted Most Improved Player by my teammates-kind souls that they were. I had a nickname of Superstar which I heisted from a pro wrestler of the day in tribute to my playing time (or lack thereof) which was usually at the end of blowouts in "garbage time". Would get great ovations when I got in and it was such fun. I did have one rule of thumb to commit a foul as soon as I got in a game to make sure I had a statistic to get in box scores in the papers that would not include guys if they did not score or foul to add to the stats. As I was a forward, in garbage time, generally the guards shot it about two or three steps after crossing the half court line. Passes/assists were few and far between in garbage time. In my senior year in '74 we did have our first ever Wenona HS Golf team, which I was on. Were weren't very good, but it was fun going to meets. I was also on the cross country team my senior year to get in shape for basketball. Practice consisted of Coach Hollis talking us out in the country, dumping us off, and we ran back into town via the gravel roads. Not being that dedicated of a runner, I considered my efforts at meets to be successful if I did not walk part of the course, my time was an irrelevant concept, though I remember finishing ahead of some guys from Lostant once because they walked more than I did. At the end of the school year, Wenona did get back into the Journal Star sports pages when our basketball coach, Phil "Pit" Martin, was fired, despite the solid season. Quite a bit of controversy in our small burg. Phil was a good man, and had been fair with me, however, the players did not listen to him as players should with a coach, and connection between he and the team had not been what it should have. I hope things turned out well for him. We got Dave Hollis fresh out of Western Illinois University for out head coach my senior year in "73-74. I enjoyed playing for Dave and he was a good basketball man. Other coaches I remember are native son Bob Kemp in the mid sixties and Dave Renn, who coached for one year when I was a freshman. My family dates back to the late 1800's in Wenona, and were a part of the town until 2000 when my Mom and Dad moved to Peru. I treasure the time I spent growing up in Wenona ( I now live in the Quad Cities).It was a privilege to be a part of the community and know the people in Wenona. it was great fun cheering for the Mustangs as a youngster, and wearing the black and orange as an athlete. it is great to have this page as a memory of those "wonder years." Larry Flesburg Class of "74 Wenona High School"
A big thank you goes out to Marcia Burroughs (Class of 1977) for her assistance in researching the sports history of Wenona High School!